Her education background – both in her schooling and teaching - influences everything she does. Her Bachelor’s degree from Texas A&M University is in Political Science. She focused on international affairs, so she learned about negotiations and the importance of dissecting situations from different perspectives. Her Master’s degree from UTSA is in Educational Leadership. She learned about running a business, as well as educational psychology – behavior change and behavior management. As a teacher for 11 years in a Title I district, she was able to apply all of this and figure out what makes individuals tick and, therefore, what will get them to change and be successful. She left the classroom in 2004 to start her own company. In both her individual consulting and trainings, she uses all of those skills to teach audiences how to pin-point their barriers to personal efficiency and implement changes that will save their sanity – and save the companies for which they work a great deal of money. Anyone who’s attended one of Helene Segura’s time management keynotes or workshops knows that she’s a huge advocate of slowing down and taking breaks. This gives your brain a chance to get re-combobulated. Or un-discombobulated...whichever you prefer. Staycations offer a respite for the brain from work strain. Vacations allow you to completely recharge body, mind, and maybe even soul. But in our go-go-go workaholic society, that’s a philosophy and mindset that isn’t widely accepted or practiced. Whether you’re leaving town for one day, one week, one month, or one year, experience the feeling of true relaxation, and be able to return to work without dread. While you can use the information in this book to help you prepare for work-related trips, the ultimate goal of this book is to help you experience smooth sailing on your personal journeys. 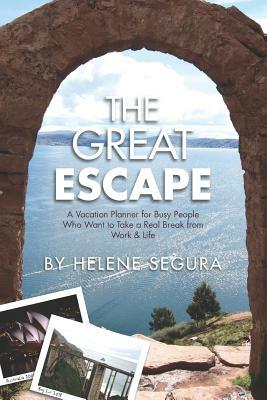 Whether you need a vacation planner or stress relief guide or getaway planner or trip planner or stress relief planner or great escapes book - no matter what you call it...if you want to go on holiday without worries, this travel planner is the ultimate guide for leaving your work life and personal life behind! Enjoy your great escapes!